As the new capability is only available on iOS 11.3 and tvOS 11.3, the supported device set is currently limited to Apple TV models capable of running tvOS. That means beta testers looking to try out the new feature will need at least two fourth-generation Apple TV, or Apple TV 4K, units and an iOS device as a controller. 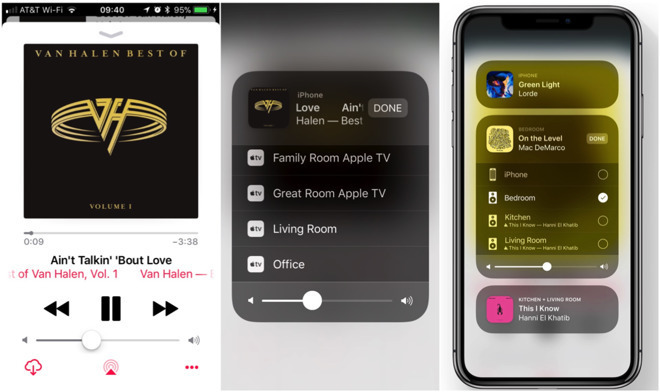 With AirPlay 2, beta testers can simultaneously stream music from an iPhone or iPad to multiple Apple TV devices through the Home app. The Apple TV units can be in separate rooms, similar to multi-speaker solutions offered by OEMs like Sonos. The current implementation does not appear to be a polished, finalized version of AirPlay 2, as only barebones remote control support is provided. Users can start and stop music streams on multiple Apple TV devices, which output sound through a connected television or speaker, but more advanced operations like track selection, shuttle controls and volume are not yet available. Apple first announced AirPlay 2 at the Worldwide Developers Conference in 2017. The wireless standard builds on the original AirPlay with multi-room audio, HomeKit integration and other system-level improvements that allow users to listen to and control content throughout their house. When it sees launch, AirPlay 2 will boast a collaborative "Up Next" feature for sharing playlists with friends. Apple previously said that existing AirPlay-compatible devices can be updated to support AirPlay 2, but the company has provided little information beyond its initial announcement. Third-party speaker manufacturers, including Sonos, have pledged compatibility for AirPlay 2, though none have released products that support the standard. At CES this year, AppleInsider discussed the issue with a number of speaker manufacturers, some of whom said Apple has yet to supply them with the software needed to implement the protocol. That could soon change with the release of iOS 11.3. Interestingly, Apple's own HomePod, due for release on Feb. 9, will not support multi-room audio at launch. The delay could be related to the speaker's firmware, however, as stereo sound through HomePod pairing is also slated for release "later this year."